16 FCC students trained by Rescue 1122 as Medical First Respondents were given certificates in a ceremony organized by Red Crescent Youth Group (RCYG) on 19 January 2012. M Shafiq (President RCYG) started the ceremony by sharing his experience of the training. He said that he felt pride in what he had learnt to serve mankind. His instructors inspired him to learn more and work for the mission of ’saving lives, changing minds’. A short video was also showcased on the occasion showing a group presentation which took place during the 15-day training. Addressing the audience, Dr Armacost said that he was very proud to see the students trying to bring about a change in the society. He said that FCC has a long history of following its motto ‘By love, serve one and other’ and by taking the MFR training, the students have proved to live by it yet again. He also encouraged other students and faculty to come forward and join RCYG’s efforts. Dr Rizwan, congratulated the 16 MFRs and thanked RCYG for taking initiative for the cause. He said that he could see Pakistan changing and called the participants of the training agents of change. As a doctor, he said, he learns everyday that the feeling of saving even one life is unforgettable and the price for it can never be paid. 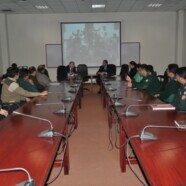 He hoped that more students will take part in the MFR training. Dr Jim Tebbe and Cheryl Burke also encouraged the students for their effort. Certificates and souvenirs were distributed among the students who took MFR training and their instructors.